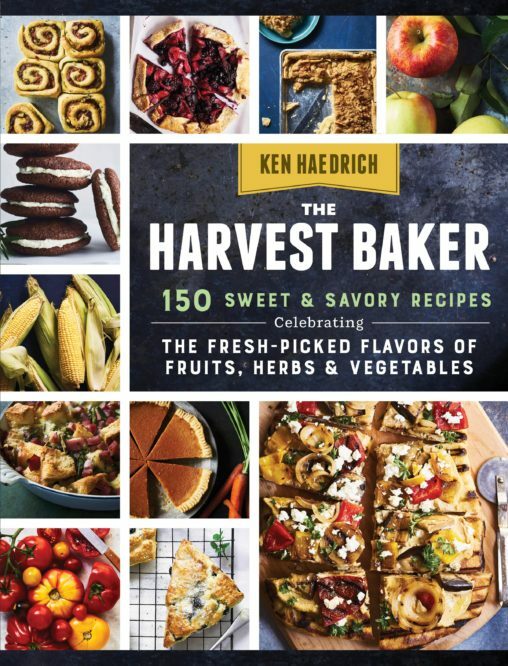 A Warm (and Furry) Pre-Holiday Road Trip to New England – join Ken Haedrich, Dean of The Pie Academy, as he and his wife Bev head north to New Hampshire to kindle familial flames and bake a really big apple pie. 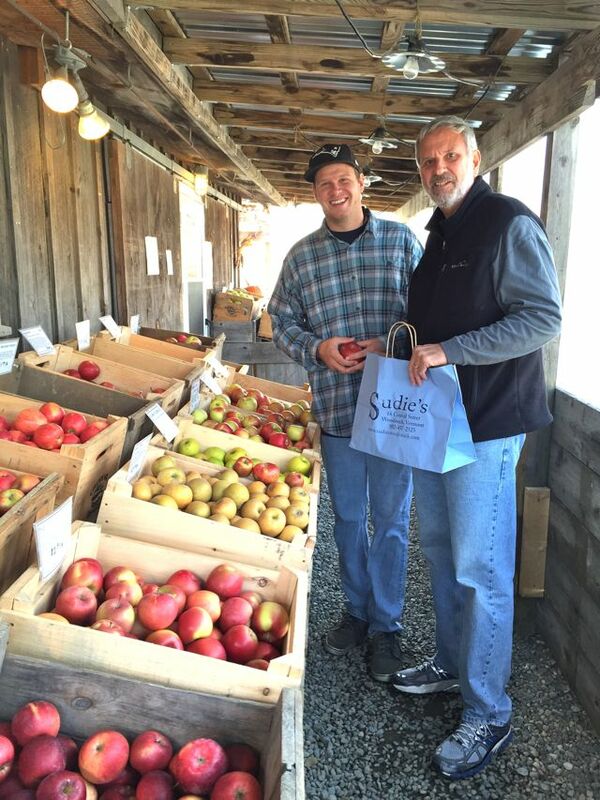 Sam and me shopping for apples in Norwich, Vermont. Found my pie favorites: Northern Spy. I’ve reached the age in life where I feel entitled to exercise certain privileges, perhaps none so advantageous to my mental and emotional health as not traveling over the holidays. Traveling at the holidays and putting oneself at the mercy of overworked TSA agents, capricious weather, and Woodstock-like traffic jams on I-95 that threaten to drain every last drop of holiday cheer from your veins – this is self inflicted punishment for those who must atone for sins far greater than my own. 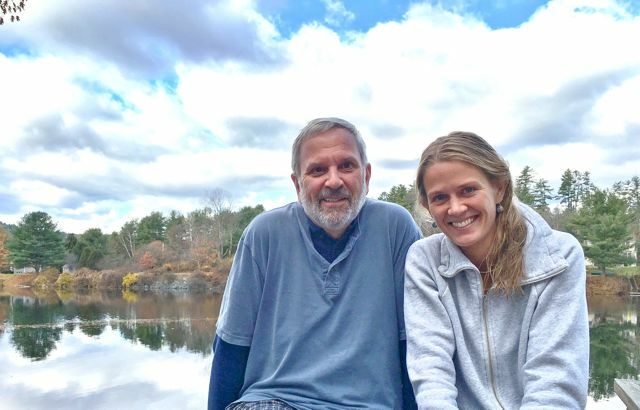 So it was that my wife Bev and I took a mid-fall excursion to New Hampshire several weeks back, a pre-holiday jaunt to kindle familial flames with three of my four children, and to visit the place I called home for 20 years. Even without heavy traffic, it’s no Sunday drive from coastal North Carolina to Hanover, New Hampshire. So we made a leisurely 3-day trip of it, stopping to see family along the way and arriving on a windy evening when the remnants of fall foliage were making their last stand. Me and Tess on a chilly fall morning, the Connecticut River drifting by. Our hosts for the weekend were my daughter, Ali, and her boyfriend Mark, who share a home within a coin’s toss of the Connecticut River. 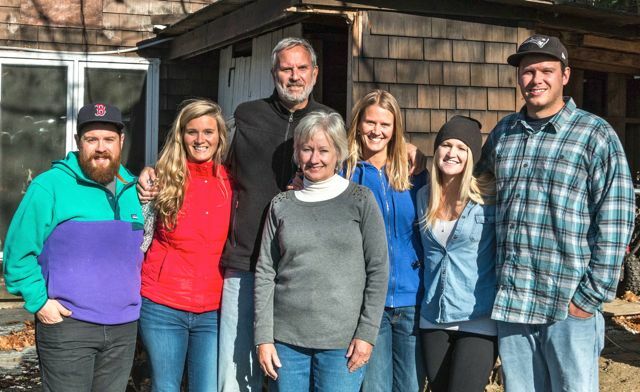 This was our first time here and it brought back memories of my original home in New Hampshire – modest but homey, a good place for a start, and enough projects to keep one busy for some time to come. Joining us for the festivities was my son Sam – a talented photographer who took many of the better photos here – and girlfriend Emily; my daughter Tess and her boyfriend Mike; and a colorful assortment of mellow cats and rambunctious dogs, a vast and varied nation of fur whose recipe for coexistence could be a model for world peace. The NH gang: Mark, Ali, Pop, Bev, Tess, Emily and Sam. One perk of writing cookbooks is a ready-made supply of Christmas gifts when the season rolls around. 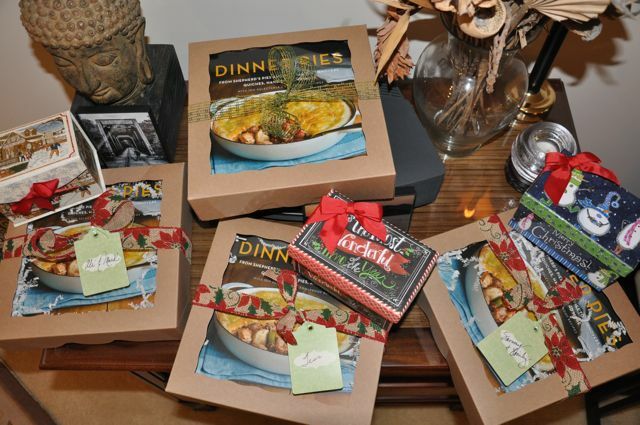 These gift-boxed copies of my new book – Dinner Pies – would make the trip north with us and provide the inspiration for one the weekend’s meals: an onion and cheese galette. 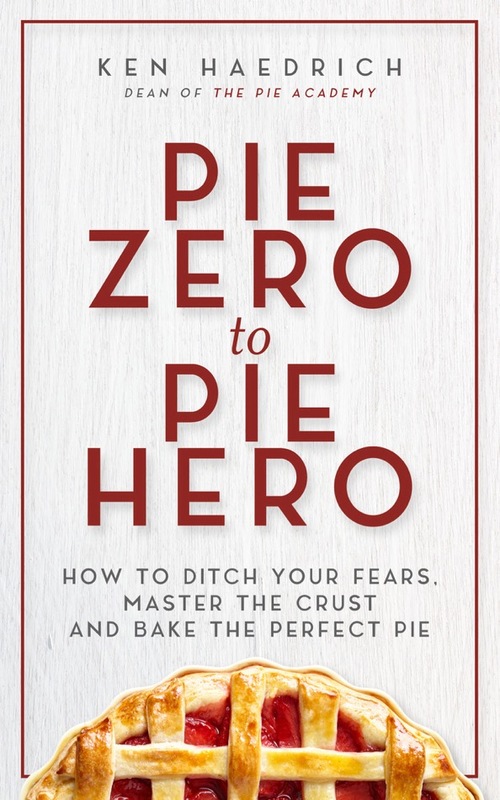 Recently, an interviewer asked me if I had any “inside tips” for someone who might be interested in baking dinner pies but thought they required too much effort. I said “galettes” and then explained their simple appeal: just roll out the dough; cover with your toppings; turn up the edges and bake. 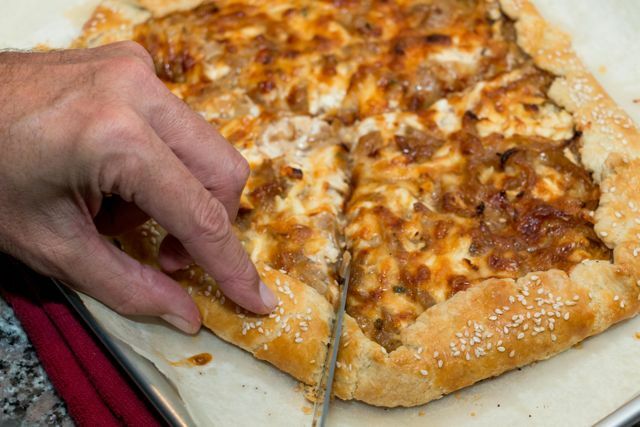 It’s pizza for pastry lovers, and every bit as delicious. The secret to a fabulous onion galette? 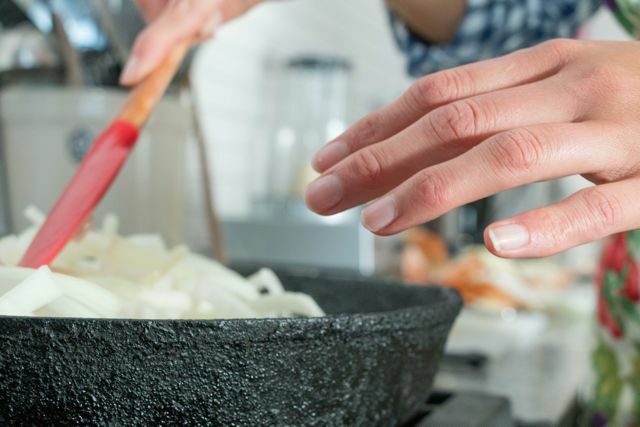 Start with lots of onions and cook until caramelized and full of flavor. Ali and I had some catching up to do in the pie department. 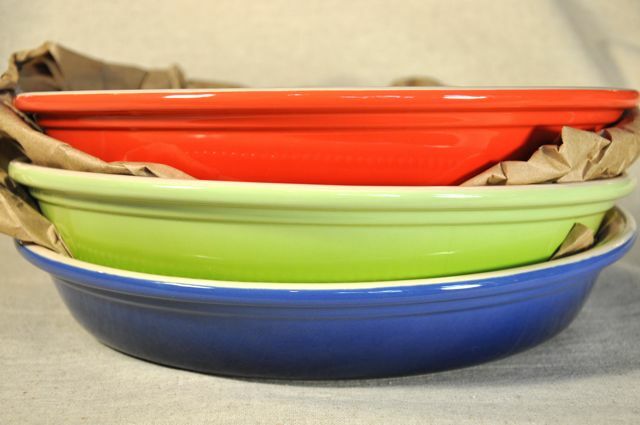 We did our share of baking together when she was a child, and none recently, so I knew that her hostess gift – a big Le Creuset pie dish – would bring back fond memories of earlier times. That’s Ali and me, circa 1991, Sam in the background. A magazine shot this photo for a story they did about my first big cookbook, Country Baking. 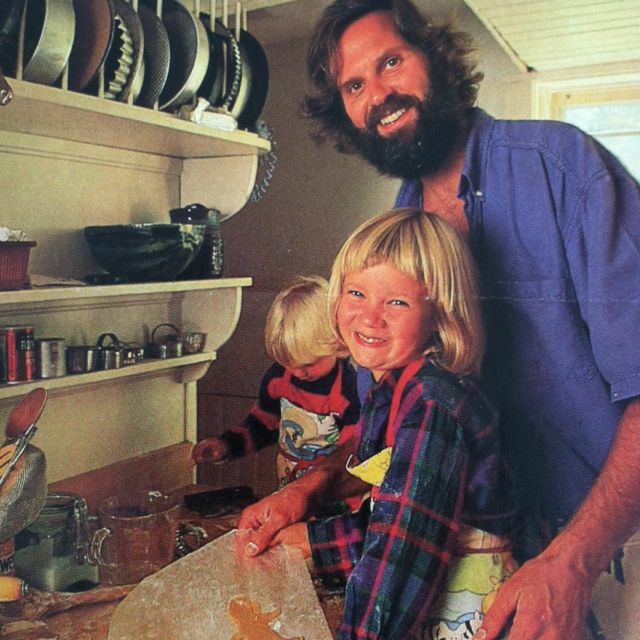 My wife Bev cringes every time she sees this photo; I can’t imagine why. Below, Ali and me today, sporting – perhaps – a less cringe-worthy do. 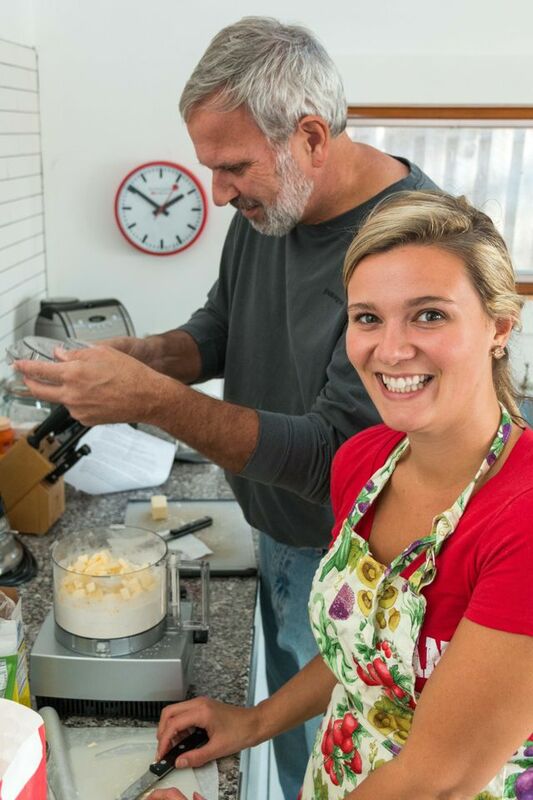 Ali inherited some of her father’s and grandfather’s pie making DNA because she breezed through our pie session without missing a beat. Both she and Tess are accomplished and confident cooks. It was a such a pleasure having both of them there and watching them turn out incredible meals so effortlessly. Made their pop downright proud. 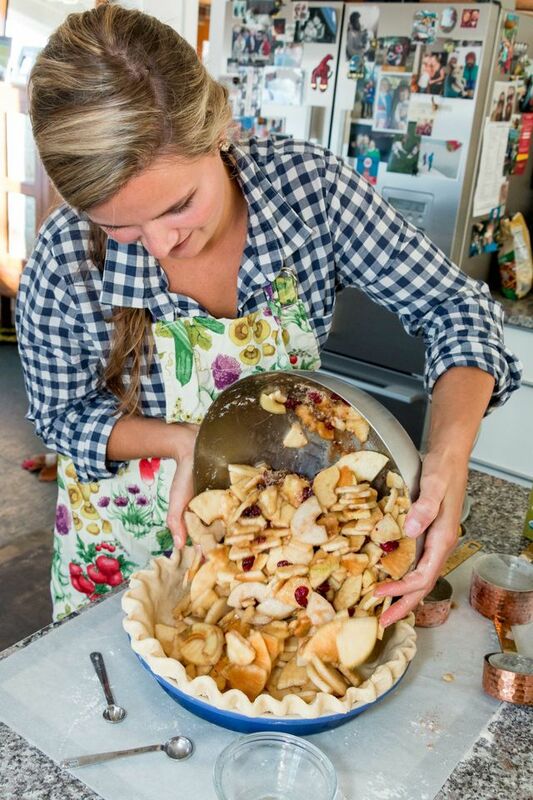 Because Ali loves cooking for parties and all her friends, I knew this oversized pie dish would find a welcome home in her kitchen, as it does in my own. I use the same pie dish for birthdays and tailgate parties, potluck dinners, family reunions and – of course – at the holidays. Depending on the type of pie, it will serve 12 people with no difficulty. 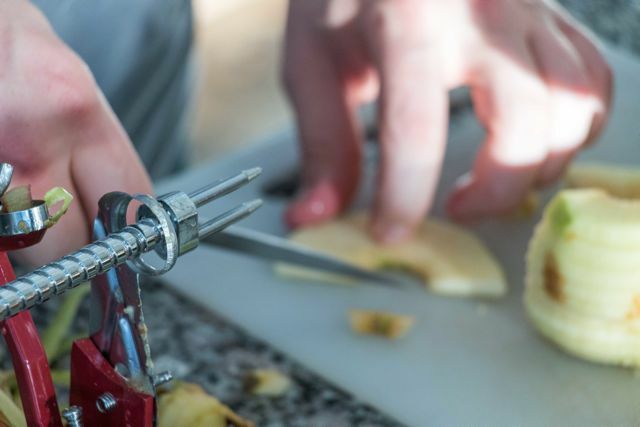 Mark’s hand cranked apple peeler-corer made short work of preparing the apples for Ali’s apple-pear-cranberry pie. For the life of me, and after four decades as a pie maker, I can’t understand why I don’t own one of these handy peeler gizmos. My stubborn, old-school nature, I suppose. Here’s Ali’s filling going into her fluted shell, and if that looks like a whole mess of fruit, it is – about 10- or 11-cups worth. For most recipes, I can simply add half again as much filling and it works beautifully. 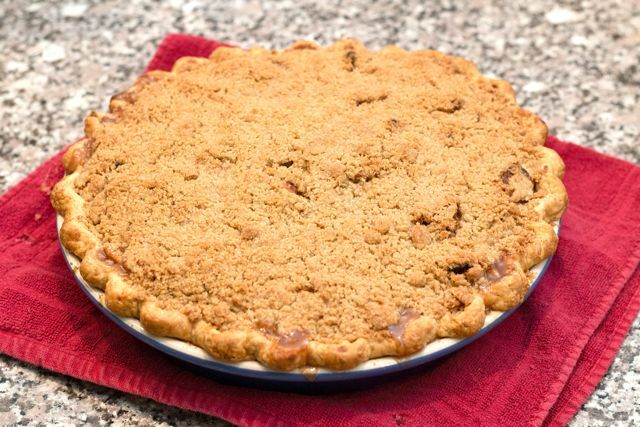 After the first 30 minutes or so in the oven, it was time to spread the brown sugar crumb topping over Ali’s pie. Then it was back in the oven for round two, another 30 or 40 minutes to get the fruit juices boiling and the top golden brown and crunchy. Fall is a wonderful time to be in New England, especially when family gathers to celebrate the season and share the love. The autumn air is crisp as a fresh picked Northern Spy, and the skies a Kodachrome blue. Winter’s heavy lifting – the dead car batteries, stove stoking, and snow moving – is still weeks away. It’s enough to make even a taciturn Yankee crack a little smile and offer a friendly greeting. Our time in New Hampshire and Vermont was too short, but as sweet as the pie we all shared. We plan to return soon, certainly by next fall. (We’d love to schedule some baking classes and demonstrations in New England, so if you belong to or know of a group who might want to sponsor such an event, please let us know.) Until then, we’ll savor the memory of our time up north, and give thanks, this Thanksgiving, for family – and all of our Pie Academy friends! – near and far. The holidays are upon us, so we’ve been busy coming up with some irresistible deals for our loyal Pie Academy members. We’re going to let you know about these deals every few days, BUT THEY’RE ONLY AVAILABLE HERE, AND NOT THROUGH OUR ONLINE STORE, SO PLEASE READ CAREFULLY BELOW TO FIND OUT HOW YOU CAN TAKE ADVANTAGE OF SOME GREAT SALE PRICES ON OUR PRODUCTS. 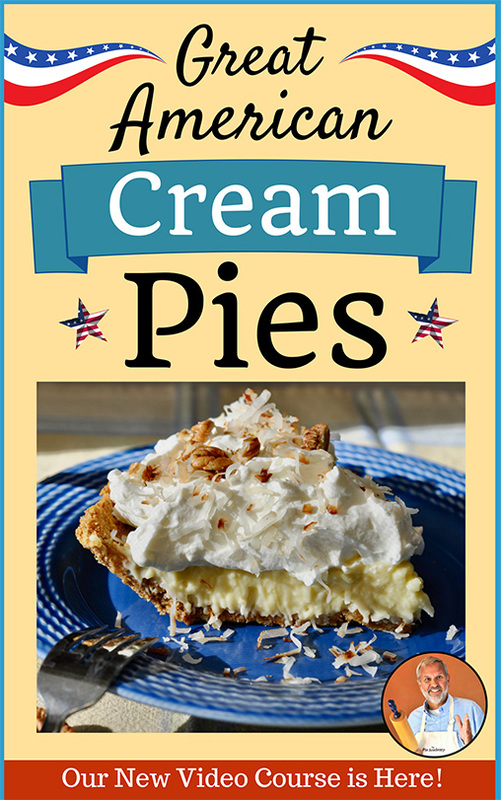 -Go to our online store and read all about this pie dish, but do not purchase it there. -Come back here and check for the available colors. They are listed right below and the list will be updated as we receive orders. PLEASE NOTE THAT WE HAVE VERY LIMITED QUANTITIES OF THESE DISHES AND – AT THIS SPECIAL PRICE – THEY’LL GO QUICKLY. Cobalt Blue – Sorry – sold out! Kiwi Green – Sorry – sold out! Coral – Sorry – sold out! 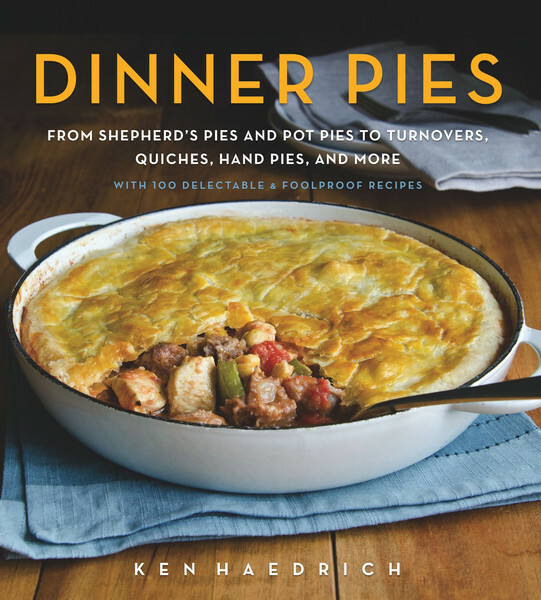 SPECIAL BUNDLE BONUS: Order a copy of PIE by Ken Haedrich, Dean of The Pie Academy, to go with your pie dish, and get both for $45 (a 20% savings) If you do order a copy of PIE, please let us know who it is for so Ken can personalize it for the recipient. 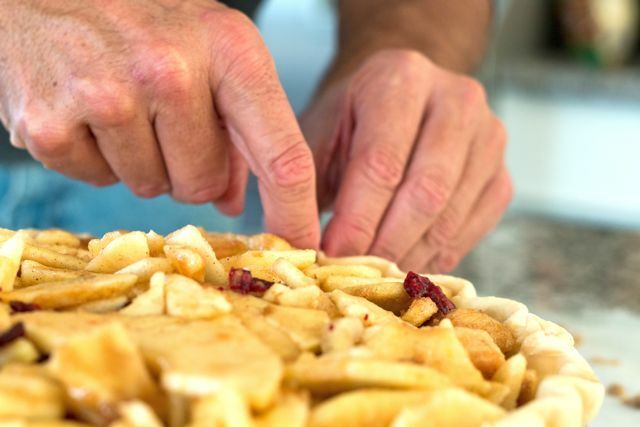 -Send an email to bev@ThePieAcademy.com and give her your order. We will need your shipping address and and phone number. We will calculate the shipping charges to your address and email you a PayPal invoice. PLEASE NOTE: we will gladly ship to another address if this is a gift. Also, if you don’t use PayPal and prefer to send a check, let us know. It’s that easy. Let us know if you have any questions.